When we’re out together making fused appliqué! Me (lying): Sorry. Couldn’t help it. That’s a wall-hanging in progress, which I made last month at the Irish Patchwork Society quilting weekend. The class was led by Joke Buursma, who designed the project. 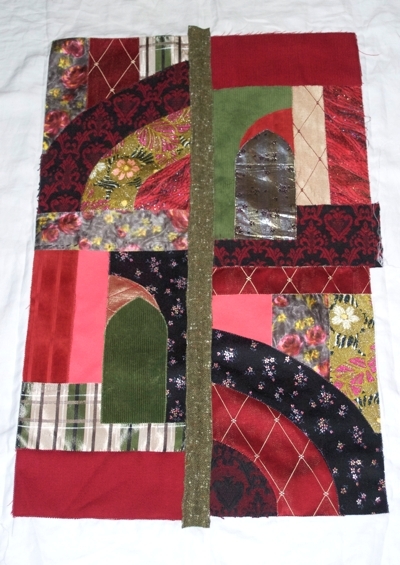 It’s called “Gothic Arches”, and the aim was to work with fabrics other than the standard quilting cotton we know and love. I made mine with pieces from my Great-Auntie Maureen’s scrap bag. It still needs embellishment, borders, and binding. I’ll tell you more about it when I post photos of it in all its finished glory. I have a big plan for April: I’m booked into a Rally (Rally!) in Portland, Oregon, under the aegis of Havi Brooks (she of the Fluent Self). A Rally, as you’ll know if you’re versed in the Haviverse, is an opportunity to come together with other people in a space devoted to focused play. There’s Shiva Nata and crayons, silence and laughter, and something called Old Turkish Lady Yoga. People have breakthroughs, get clarity, make unbelievable progress on their things. We’re talking about an exuberant, rich, multi-level experience. For me, for my creative work, for my business, I truly believe that it could change … well, everything. Currently, I can’t afford the airfare and accommodation. Over the next couple of weeks I’ll be working on raising the money to cover them. So look out for a flurry of activity around these parts, and lots of stringy, revolutionary goodies coming your way. Small print: It’s a mailing list. We know how those work, yes? You trust me with your address, and I respect your trust. End of story.